Potatoes are such a great and versatile vegetable that can be served up in many ways that my whole family will eat it (score!) Baked, mashed, whipped, ‘fried,’ or in a salad, it’s all good. This Parsley Pesto Potato Salad uses delicious yellow Idaho® potatoes cooked using my favorite method – roasted! Add in a fresh and vibrant parsley pesto sauce to drizzle and toss with the potatoes, and you’ve got a rock star party Parsley Pesto Potato Salad that everybody will love! Parsley Pesto Potato Salad starts with roasted yellow Idaho® potatoes. You can easily substitute russet or red potatoes, if desired. Roast the potatoes until just golden to get that firm texture with an amazing flavor. While the potatoes are cooking, simply dump the rest of the ingredients in a food processor to make the pesto. Once the potatoes are cooked to perfection, put them in a serving bowl, pour the pesto over the warm potatoes and toss to coat. Served warm or chilled, Parsley Pesto Potato Salad is sure to become an instant favorite! Preheat oven to 400°F. Line a large rimmed baking sheet(s) with foil and spray with cooking spray. Toss cut potatoes with oil, sprinkle with salt and pepper as desired, and spread over baking sheet(s) in a single layer. Cook for 40 to 50 minutes, or until they start to turn golden brown. Meanwhile, in a food processor, add parsley, garlic, cheese, lemon juice and process. Add oil and continue to process until smooth. Add water as needed to achieve desired consistency. Put cooked potatoes in a serving bowl. Pour pesto over cooked potatoes, and toss to coat. Serve warm or chilled in the refrigerator. Additional Parmesan cheese may be added for serving. 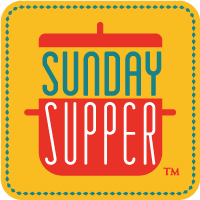 This week Sunday Supper is partnering with the Idaho Potato Commission to share potato salad possibilities. Today you will find recipes for all types of potato salads using Idaho® potatoes. There are so many good ones…enjoy! I’ve always made pesto with basil (primarily but throw other herbs in there too). I can’t wait to try this one with parsley as the main feature and tossed over those tasty roasted potatoes. Looks fresh and delicious! I like this version of potato salad! This looks just amazing! I am so loving the pesto you added to it! Mmmm….I love using pesto in recipes, and what a GREAT idea for the potato salad. Parsley goes so well, must be delicious! Love the color on this salad Yummy!! What a fantastic combination — pesto and potatoes! Your family is sooo lucky, Alida. Your dishes and desserts are always culinary masterpieces. This parsley pesto infused potato salad is no exception! I absolutely love pesto potato salad .. I was going to make this! 🙂 I could eat pesto everyday I love it so much. . your potato salad looks fabulous! Roasting is definitely my favorite, too – my mouth is watering…this sounds fantastic! What a pretty potato salad. It looks so beautiful and delicious at the same time. Love this! My husband hates basil so I never make pesto but since yours has parsley in it I can’t wait to try it!